Sinterklaas! Sinterklaas Benefit with Tuba Skinny - Sinterklaas! We all loved Tuba Skinny so much last year that we invited them back for this year’s Sinterklaas Benefit event. This amazing night of fabulous New Orleans Jazz is a private gathering that will help raise the funds required to bring Sinterklaas to the Hudson Valley for another year. Get your dancing shoes out! Suggested donation: $30 at the door. Come hungry! Papa's Best BBQ's food truck will be selling from its full menu of delicious goodies! TUBA SKINNY is dedicated to bringing the traditional New Orleans sound to audiences around the world. Drawing on a wide range of musical influences—from spirituals to Depression-era blues, from ragtime to traditional jazz—their sound evokes the rich musical heritage of their New Orleans home. The band has gained a loyal following through their distinctive sound, their commitment to reviving long-lost songs, and their barnstorming live performances. 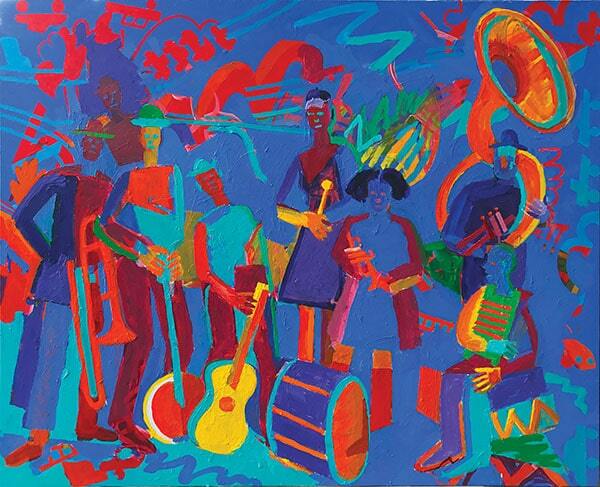 painting of the band by Bernard Greenwald.